Commitment is important to both of us. If you find you need to change your appointment, please give as much notice as possible. I will do my best to find an alternative time that is convenient for you. You are kindly requested to give a minimum of 48 hours notice, preferably by telephone, as emails may not always be picked up in time. Please call my mobile number in case of very short notice. It all helps. It is your responsibility to ensure that your notice of cancellation or request to change your appointment has been received in adequate time. You will receive confirmation by email when I receive your message. Your appointment can be re-arranged or you will receive a refund of your payment via paypal (minus any paypal fees incurred) upon receipt of adequate notice of cancellation according to the terms of the Cancellation Policy. In case of late cancellation (less than 48 hours prior to your appointment) or missed appointments, you will be charged in full for your appointment. In such a case any pre-payment is non-transferable and non-refundable. Please be advised that no exceptions are made to missed appointments or late cancellations. 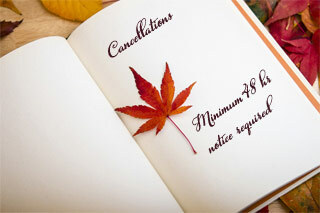 The Cancellation Policy applies to all appointments and are the terms you agree to when you make a booking. Please also read the disclaimer.